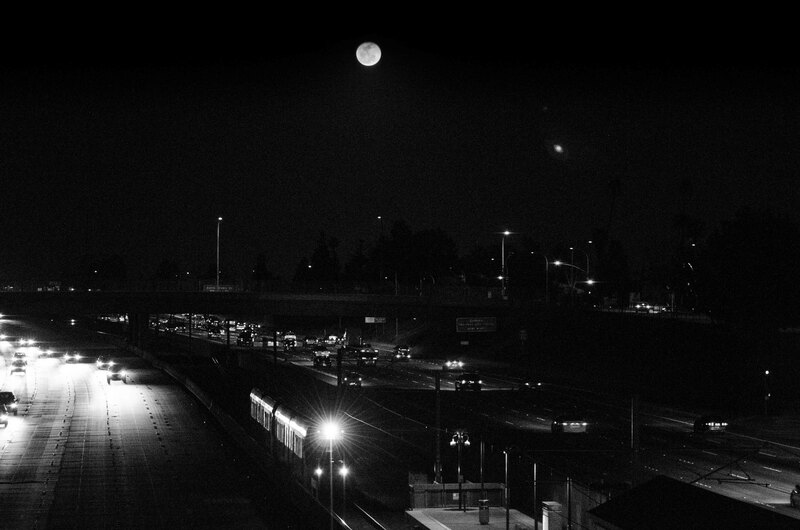 ART OF TRANSIT: It’s a full moon on Sunday night, meaning it’s time for another Metro Full Moon Photo Challenge. Get the full moon in a photo with a Metro bus or train and we’ll feature it in this space, earning you great amounts of fame on the World Wide Web. Booya! Photo by Steve Hymon/Metro, taken in February from the Lake Avenue bridge over the Gold Line and the 210 freeway. @MackenzieTBM: I don’t get too wrapped up in follower counts. All I know is I have rock in front of me, concrete behind me, and I’ll be followed by 60 million gallons of stormwater and sewage when my job’s done. You don’t text and drive, do you? Neither can I. @BerthaDigsSR99: I’m a huge fan of the Mars Curiosity Rover, but I recognize she has more important things to do than follow me. I can only imagine what Martian soil tastes like. @BigAlmatheTBM: I have about 300 followers, and Mom Chung has 350. I’d be absolutely thrilled to tweet with Mike Rowe, the star of my favorite TV show, “Dirty Jobs.” I’m a huge fan and really respect his work. Plus I think he’d really “get” me. Metro will hopefully have some TBMs joining the fray soon as tunneling will be needed on the Crenshaw/LAX Line, Regional Conector and Purple Line Extension. The main airport serving the Inland Empire is operating at about 25 percent capacity and is on track to handle fewer than four million passengers in 2013. There have been declines at Bob Hope Airport and Long Beach, too, while passenger loads have increased at John Wayne Airport in Orange County and LAX. An aviation consultant blames Ontario’s woes on Los Angeles World Airports, which owns and operates the Ontario facility and says LAWA hasn’t redistributed air traffic as promised. Protests in Divinopolis, Brazil, on Wednesday. Photo by Fernando H. C. Oliveira, via Flickr creative commons. Protests that started over a proposed increase in transit fares have escalated to much larger protests across Brazil over a long list of citizen complaints — costly stadiums, corrupt politicians, high taxes and shoddy schools. Officials have made concessions on the fare hikes, but protestors have not been placated. Construction is proceeding in a timely manner from Pasadena to Azusa. But the Gold Line Construction Authority also has, unlike virtually any other project in Los Angeles or on the Westside being promoted by Metro, ownership of the right of way and an approved Environmental Impact Report all the way to Claremont. After that, it would be just a short and logical hop to Montclair and then the proposed Ontario Airport Extension that makes all the transit sense in the world. •Metro has completed the environmental studies for the Crenshaw/LAX Line, the Regional Connector and the Purple Line Extension. All three are scheduled to be under construction within two years. In the mean time, they’re proceeding with securing contractors, relocating utilities and other activities to get ready for construction. •Measure R is funding the extension of the Gold Line from Pasadena to the Azusa/Glendora border and an extension of the Eastside Gold Line to either South El Monte or Whittier in the San Gabriel Valley. Whether or not the full Metro Board amends the acceleration plan to show the cost of going to Claremont, the fact remains that not every Measure R project is fully funded by Measure R, the reason the subway isn’t making it to the sea, the Connector isn’t stopping at 5th/Flower and the Crenshaw/LAX Line isn’t going north of Exposition Boulevard. As for the bit about the Ontario Airport, perhaps the Los Angeles Newspaper Group’s editorial board should read the story it just published in one of its newspapers about declining use of the facility. See the above story. Will the Regional Connector include a box station at 5th/Flower for possible future construction at a later time? I believe the Regional Connector is being built in such a way that a station could be added later if funding is found. Metro has seem to find funding for Leimert Park station on the crenshaw line, why not 5th/flower? Just take from the 405 account, you have spent too much on that god awful freeway anyway. Thanks about the photo! I think there’s one key difference worth acknowledging: the community in South L.A. and Leimert Park made a big push to get that station funded. That never really happened on 5th/Flower — furthermore, our friends in the media largely ignored that issue whereas the Leimert Park station has received considerable attention. If I remember correctly, the Metro board was supposed to meet today (or monday?) about America Fast Forward project acceleration. Please keep us in the loop. First, I hope your exile is going well. Yes, Board committees met the past two days (I was there, too). There was very little discussion about the acceleration plan — basically the item was moved to the full Board for discussion and consideration at the 9 a.m. meeting this coming Thursday (the 27th). I don’t have any real sense of which way the Board is leaning. I do know the item requires nine votes instead of the usual seven and acceleration efforts have certainly been divisive in the past. So we’ll see. I’ll be at the meeting and will certainly be posting about it. Yeah that makes sense and 5th flower is not that far from 7th/flower. I just wish the connector would be here already. Instead of extending the Gold Line to Ontario Airport, maybe Metro should consider working with Metrolink to extend the Riverside Line to serve Ontario Airport. Maybe Metrolink can add a few short trips to Ontario Airport via Riverside Line during midday and weekends. I, for one, welcome our new Tunnel Boring Machine overlords! @Zhang: East Ontario station is on the wrong side of the airport. The Colton line goes right in front of it, but Metrolink doesn’t go that way. Maybe a branch route serving Ontario Airport-Colton-SBD would be optimal. Not all the blame lies on LAWA. Ontario also fails to attract attention on international airlines and that’s their biggest problem. LAX is more closer to everywhere than Ontario which is too far away. Therefore, LAX has a lot more international flights than Ontario. Furthermore, LAX is a major international hub for the three major global airline alliances, oneworld, Star Alliance, and Skyteam. Ontario is not. That being said, I don’t expect British Airways to fly London-Heathrow to LA Ontario, Singapore Airlines to fly Changi to LA Ontario or Korean Air to fly Seoul-Incheon to LA Ontario Airport anytime soon. And if they don’t, neither will their US domestic partners, American, United, or Delta will move to Ontario either. It’s all about partnerships, alliances, and better transfers and connections nowadays. This is why we have flights like San Diego to LAX on American Eagle, then transfer from LAX to Santiago on LAN Chile. This is why we have flights like Albuquerque to LAX on United Express, then transfer from LAX to Tokyo-Narita on All Nippon Airways. And why we have Phoenix to LAX on Delta Connection, then transfer to LAX to Paris on Air France. And vice-versa. High jet fuel prices ended the point-to-point ideas that their airlines had in mind. Instead, airlines have to do what they have to do to maximize their fuel efficiency and save their overall cost: create partnerships, make international alliances, send the passenger to major hub, and transfer that passenger to their alliance partner. OTOH, the non-allianced low cost carriers like Southwest, Spirit, and Virgin America can probably move to Ontario. Their main passenger base are domestic passengers. It would make sense for Southwest flyers to fly into Ontario if their final destination is LA. But the big three domestic carriers like American, United, and Delta, their passenger base include both domestic and high value international transfer bound passengers. Catering to a different passenger group, where they fly to are dependent on where their alliance partners fly to. And their alliance partners fly to LAX, not Ontario, and I doubt they will do so in the future as well. That makes sense. My relatives live in Panama. They fly into LAX first using Copa Airlines and then they fly with me to El Paso on United which is where my dad lives. It’s much more convenient for them and for me to transfer at the same airport than go from LAX and switchover to another flight all the way out in Ontario. LAWA could easily do the same thing, to Rancho Cucamonga and the East Ontario stations, but choose not to. A major reason for the decline in ONT passengers is the higher cost to fly out of ONT. LAWA increased landing and takeoff fees at ONT in order to get the airlines to use LAX. While the Inland Empire has a larger Latino population Airtran decided to offer flights from Orange County to Mexico instead of ONT. Is it because ONT fees are too expensive. The bottom line is always profits. LAWA treats ONT like the ugly step child. . Landing fees for LAX are much more higher than ONT. LAX charges close to $4.50 per 1,000 lbs compared to ONT which is about $2.40 per 1,000 lbs.